I realized a few weeks ago that I have a Chap Stick addiction. I’m not even kidding. I never thought of it as an addiction, of course, because come on, flavored wax? An addiction? Anyway, I was in the airport heading back from Tampa and the TSA agents made us empty our purses of not only traditional liquids but also any lip goo or balm of any sort. I ignored them – always smart. When it was my turn to go through the feel-up-pat-down, they asked me to empty my handbag of all lip products (they were not joking) and go through again. The contents of ONE bag in my purse. This does not include my emergency hidden stash, what is at my desk, and the lip stuff stored in the cabinets around the house. “No, it isn’t,” I said, as I slathered on another layer. “It is, look it up,” she says. And so I did. Did you know there are websites devoted to this problem? I mean, pages and pages of testimony and quotes from Dr. Oz (who we all know is never to be questioned), and therapy centers. These websites give tips on how to quit the habit and explain why lip goo is bad for you. I was astounded. I felt so . . . . wrong. I had no idea it was such a problem! Right there I vowed to quit. No way would that be hard. Addictive, my foot. Day One – I took my shower, brushed my teeth and instead of putting on Chap Stick after my face lotion, I left my lips alone. By the time I was done drying my hair, my lips felt tight and crinkly but I persevered. I drank some water to hydrate my skin and drove to work. At work, my two favorite lip balms sat by my phone. I looked at them with longing, feeling like my mouth looked like the Sahara Desert, but I tucked them away into a drawer. I reasoned that if they were out of sight, I’d be alright. “Like I’ve been sucking on a salt lick for days,” I’d say. “You look fine. I can’t see any difference,” they’d say, and in my head I’d call them a liar. Through dry, cracked, dead skin lips I’d croak, “Okay . . .” and she’d go off to get a Diet Coke. After lunch, where I liberally used a dry, sandpaper napkin, I felt like I had taken a nail file and scrubbed the outline of my lips. I just knew I looked like my lip liner had done something very, very wrong, and I don’t even wear lip liner. “I’m giving up Chap Stick,” I continued to announce throughout the afternoon, mournful and full of regret. “It’s addictive. I’m an addict.” I’d show them the contents of my purse and they would nod knowingly. I made it through the afternoon. I’m not sure how. I spent the better part of the hours between one and five in the bathroom, passing through all the water I drank trying to hydrate my cement-like lips. Daisy continued to check on me, offering support and cautioning me to have patience. “I promise, Jimmie. This will pass. You have to give your skin some time to adjust.” I said okay, all the while shooting daggers from my eyes at her. It was the longest afternoon of my life. At bedtime, I flossed my teeth and drank another glass or two of water. I tucked away all my lip products in drawers so I wouldn’t accidentally use any of them in the middle of the night (I’ve been known to do that.) I went to sleep, dreaming of waxy-like substances in every flavor (except cherry because everyone knows that cherry-flavored Chap Stick is gross). Let me tell you, those were some fulfilling dreams. Day Two – I awoke to lips that felt . . . .soft. Not crinkly. Not tight and not like cement. I showered and brushed my teeth and smeared on face lotion, drank some water and went to work . . . . I didn’t even feel guilty. Not even a little bit. I put the cap back on my Palmer’s Cocoa Butter Lip Treatment, put it by the phone in its place of honor, and then opened the blue tube of Chap Stick and rubbed it all around my lips, too, defiant and uncaring. There they sit to this day, proud, ever-dwindling, my best friends. Call me what you will. I love lip goo. P.S. I know I didn’t really cover the Budget portion of my title. Hold, please. This is merely part one. Now that is comedy worthy of Dave Barry, taking something as inconsequential as lip balm to the level of heroin! Funny! I had to cover my lips with “Soothing Carmex” as I read this post. 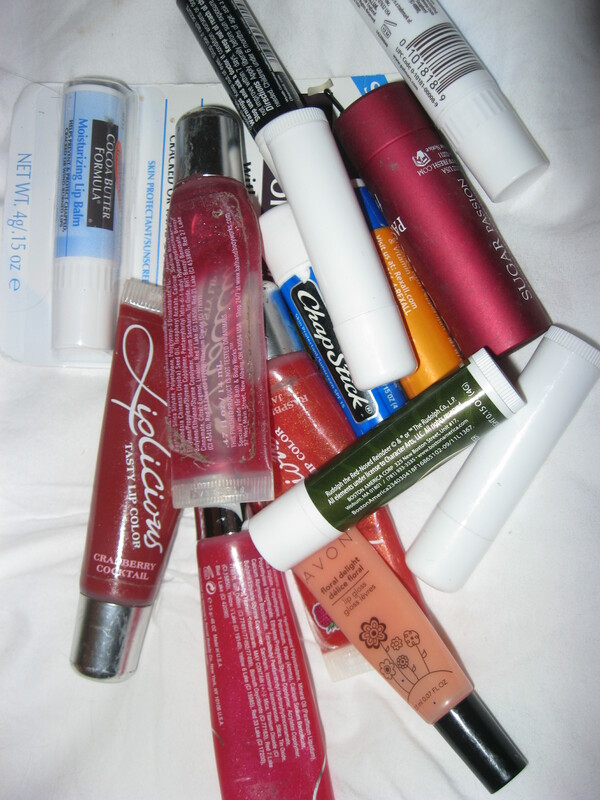 My lips felt dry as soon as I looked at the picture of all the “lip goo” you own! I’m applying a soothing coat of goo to my lips with one hand and typing with the other. I’m going to see what kind of specials I can get at the treatment center – maybe a two for one entry fee?